The bash will be headed by Panacea, one of Germanys oldest acts for heavy, uncompromising Drum and Bass. Beside him his landsman Current Value, another hard style ambassador, will play. 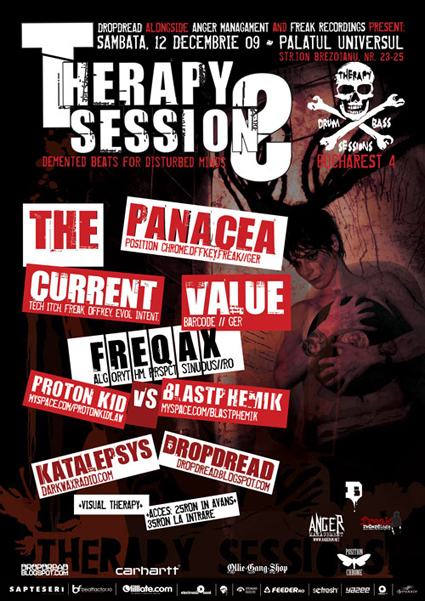 Before and after their performance a bunch of Rumanians like FreqAx, Proton Kid, Blastphemik, Katalepsys, and Dropdread (picture above) will present some of their own productions and a fine selection of rough Drum and Bass from the past. So be ready for a party where nobody will be treated with kid gloves. Because at the fourth Therapy Session only heavy bassline business set the fashion.